COM Interop is rarely fun, but it looks like it's getting to be less and less useful as time goes on and new .NET Runtime features come along that don't work well over COM. The generic interface is not exported - at least not to IDispatch. Accessing the Nicknames property does return an Object to me, but I can't seem to do anything with this object. It's not NULL, but also doesn't have any properties that should be there like Count or in case of conversion to an array a length or any array elements for that matter. It's not showing up as Collection or array, and basically any operation against it over COM fails. Apparently this is true of any Generic type which of course are pretty common in the .NET 2.0 framework and most collection types that are publicly exposed somewhere in their class hierarchy are based on one of the generic types. If I replace the code above with an ArrayList instead I can see the list fine and COM Interop transforms that array list into a SafeArray that is visible in VFP as a standard array. This change works, but of course requires that you actually have control over the object. So is it possible to make this work? Yes, but it's hideous. Basically you can use Reflection in a helper class to provide the type management so that .NET rather than the COM client code is accessing the collection directly. As I said that's pretty ugly but I have a few wrappers around this on the VFP end so the code at least doesn't need to use the _OneParam, TwoParms etc. nastiness. It works and get around some of the issues but as I said it's ugly. In most situations when working in an interop scenario where types are encountered that just don't want to pass the COM boundary I find it best to just build a wrapper function in a .NET class that can act as a proxy and pass the data back in a COM capable format. type instance in a signature. Generic code may not be exported to COM. I find it interesting you were able to still access the property since the property is not defined within the IDL created when exporting the type library. Josh - the .NET framework is a COM object (mscoree), but it's mostly a bootstrapper - the actual 'COM' calls are just proxied through this bootstrapper. Getting at the types with Reflection makes sense because when you do that you're really just accessing a .NET object through Reflection and returning the 'simple' type back. The reference is just that a pointer and the actual object lives inside of the runtime. The reflection makes sense, it;s what you identified that I find interesting which is passing types back that aren't COM visible. As I think about this more there is no reason that a closed(I think this is the term they are called) generic shouldn't be accesible via COM. 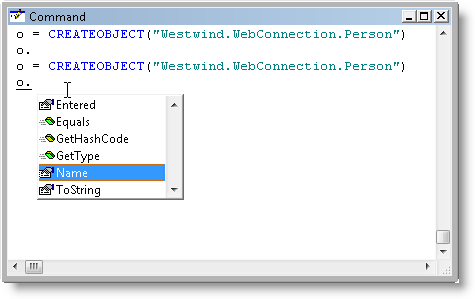 As long as the type is specified such as in your example List<string> should be visible. Sometimes trick with default interface can help. Not so pretty, but usable. I am also getting the same warnings only in Debug configuration but not in Release when I use tlbexp. In ATL C++ application both the C# tlbs are correctly #imported along with mscorlib.tlb. Please let me know if you know about this error.